The first watercolor step after the drawing is painting the sky. Mix up sufficient quantity of cobalt Blue to cover the sky area. Test this mix on a scrap piece of watercolor paper to make sure it is of the correct tone. It needs to be significantly strong that after drying the sky colour will not be too pale. Watercolor always dries quite a lot lighter than it looks when wet. In this case, as we will be pre-wetting the blue area of sky with clean water, it will further dilute out colour mix and it will end up even lighter. Painting the sky with watercolors. Blue sky with white fluffy clouds. Using the side of a number 16 brush, paint with clear water, the general area of the sky which will end up blue. The brush should be fully loaded with water to the point that the water will drip from the end of the brush if you hold it vertically with the point down. You do not have to be too accurate with this; the idea is to leave dry the area where you will have whitish clouds. 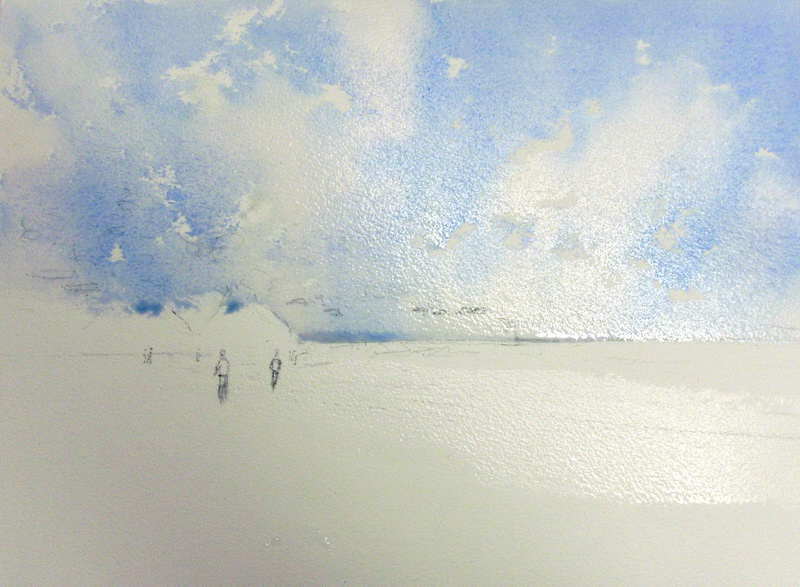 By using the side of the brush, not the point, over the textured paper, you will create interesting cloud edge shapes. Now, while the blue sky area is quite wet with water, repeat the process with the cobalt blue mix. As you paint, notice any cloud shapes that are created that you like, and leave them! In some areas you will find the cobalt blue mix pooling on the paper, this is good and will help in the next step to create more interesting clouds. Now while the cobalt blue area is still quite wet, with clean water, repeat the process, but this time do it for the positive cloud shapes i.e. the actual shapes of the clouds. Make sure you leave some of the cloud edges untouched however as these will be the highlights in the sky. Where the cobalt blue pooled, touch it with the side of the brush as you are painting the positive cloud shapes with the clean water and this pooled cobalt blue will flow down into your cloud and help create more form to its shape. It will also add some interesting soft edges to complement the hard edges you leave behind. Usually I find that the major mistake new students make with this technique is that they paint over all the white areas and don’t end up with any hard edged cloud highlights.